The classical descriptions of the sinew channels in the Lingshu are somewhat vague when it come to specifics. There are a few authors who discuss specific muscle anatomy as it relates to these channels. Notably, David Legge, Giovanni Maciocia, and Donald Kendall all offer their insight into the sinew channels and discuss which muscles belong to which channel. All of these authors list the peroneus (fibularis) longus and the peroneus brevis as part of the Gallbladder sinew channel. However, I disagree with this assessment and think they are more properly classed as a branch of the Urinary Bladder sinew channel. In this post I will give the obvious reasons why others include them as part of the Gallbladder sinew channel, and then I will explain why I have come to a different conclusion. The peroneals are found in the lateral portion of the leg and they overlie the fibula. Topographically, it would make sense to label these muscles as part of the Gallbladder sinew channel. 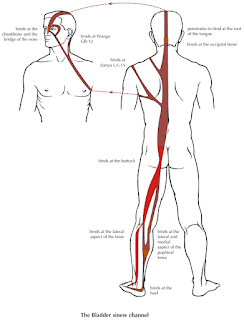 All of the above authors list the peroneal muscles as part of this channel; also, anatomist Thomas Myers lists these muscles as part of the lateral line in his influential book, Anatomy Trains: Myofascial Meridians for Manual and Movement Therapists. While his book is not about the sinew channels of Chinese medicine ("meridians" refers to what he calls "lines" in his book, not to specifically Chinese acupuncture meridians), his Myofascial Meridians parallel the sinew channels in many ways and many acupuncturists look to them for reference. His lateral line would be roughly analogous to the Gallbladder sinew channel. So, why do I disagree with all of these authors? To begin with, I will state that in my lectures in New York during the training for Sports Medicine Acupuncture in the 2013-2014 certification cycle, I included them with the Gallbladder sinew channel. This is despite the fact that the Gallbladder sinew channel is classically discussed as traveling anterior to the lateral malleolus while the peroneal muscles travel posterior to this structure. The peroneus longus does attach to the iliotibial band as discussed by Myers. Both the tensor fascia lata (TFL) and the gluteus maximus attach directly into the ITB, and the gluteus medius and minimus also link with it. These are all muscles that are associated with the Gallbladder sinew channel. However, the peroneus longus also has a strong fascial connection to the biceps femoris (the lateral hamstring muscle seen in Fig.1). Actually, I feel this is a stronger connection than that of the peroneus longus – ITB connection. While there is mechanical force transmission through the peroneus longus to the ITB, I think it is not as direct a line of force transmission as that of the peroneus longus to the biceps femoris. Deadman's A Manual of Acupuncture. When preparing a cadaver specimen for an anatomy class for the Sports Medicine Acupuncture Certification program in San Diego during the 2014-2015 cycle, Matt Callison and I did an experiment to see which line of pull was more prominent; that of the peroneus longus/biceps femoris or that of the peroneus longus/ITB. We inserted needles into the MP of the peroneus longus, biceps femoris, and into the ITB at approximately GB-31. Then we twisted the needles to get a firm grasp on the tissue and pulled on the needle. Pulling on the needle inserted into the biceps femoris MP transmitted force and caused the needle to move at the peroneus longus MP. Pulling the needle inserted into the ITB at GB-31 did not create a discernible movement at the peroneus longus MP. 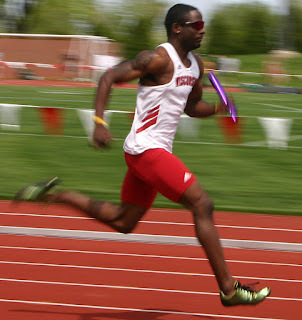 What this illustrated was that there was more of a transmission of force from the biceps femoris to the peroneus longus than from the ITB to the peroneus longus. It is worth mentioning that there was also a needle inserted at GB-34. When pulling on the needle in the biceps femoris, the needle inserted at the peroneus longus MP moved, but GB-34 did not, despite the fact that these two needles were in very close proximity. Functionally, this force transmission is important for sacroiliac joint balance, as it links heel strike with sacroiliac balance. 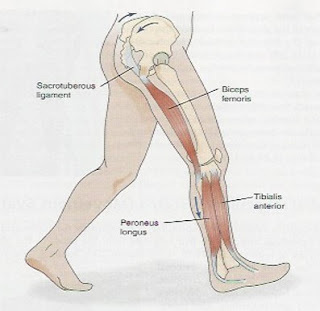 During dorsiflexion just before heel strike, the peroneus longus pulls down on the fibular head which adds tension to the biceps femoris and into the sacrotuberous ligament (which is a structure that the biceps femoris is continuous with). This tension through the sacrotuberous ligament then stabilizes the sacroiliac joint in preparation for heel strike. The biceps femoris and the sacrotuberous ligament are part of the Urinary Bladder sinew channel (Fig. 2). So, functionally and structurally the peroneus longus could be considered as a branch of the Urinary Bladder sinew channel. And, this matches nicely with the classical description of this channel. The Urinary Bladder sinew channel does indeed have a lateral branch which travels posterior to the lateral malleolus and fits the anatomy of the peroneus longus. How does this apply clinically? First off, when treating the sinew channels many practitioners treat off-channel ashi points such as trigger points (TrPs) and motor points (MPs). Often this would include treating local TrPs for pain. Knowing which sinew channel a muscle belongs to informs which channel relationships exist and helps with distal (or away) point selection. For instance, peroneal tendinopathy is a condition seen with runners, especially when they increase mileage. Pain is usually seen in the region of BL-62, is worse with activity, and is often reproduced with plantar flexion and inversion of the ankle which stretches the peroneal tendon, though sometimes eversion causes pain as it engages the peroneals. This condition might be treated locally with acupuncture by threading the tendon around the BL-62 region. In addition, the peroneal MPs should be used (the peroneus longus MP is about 1 cun directly below the fibular head). In addition, excess tension observed in the biceps femoris, the erector spinae, or even the suboccipital muscles might be used to inform point selection. If a runner has excessive capital (head) extension there would be excessive shortness in the suboccipital muscles, BL-10 and/or GB-20 might be considered as useful points employing the principle of selecting points above to treat below. Sacroiliac dysfunction is another example where considering the sinew channels is helpful. 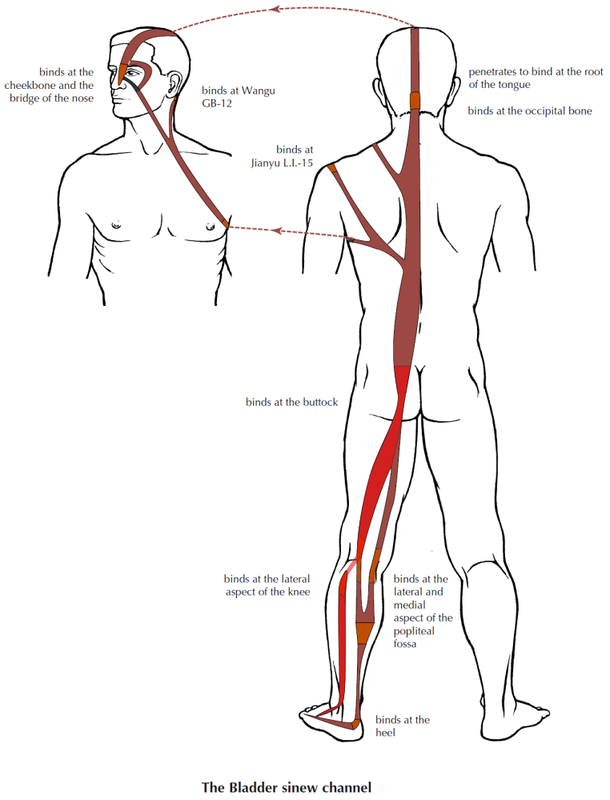 If the peroneals were either overactive or inhibited, this could contribute to the dyfunction at the sacroiliac joint, as the peroneals would either exerts too much or not enough tension through this line. Since these muscles are involved with such things as heel strike and proper balance of the arches of the foot, treatment of the MPs of these muscles would enhance any local treatment at the SI joint and would help relate heel strike and foot position with sacroiliac joint stability. TFL is part of the GB sinew channel. The lingshu describes the Stomach sinew channel as linking with the shaoyang at this region, so I this muscle can be part of both channels. I think the easy way to differentiate it is to note that the TFL performs hip abduction along with the other GB sinew channel muscles, while it can also function with the ST sinew channel muscles as part of hip flexion. There are instances when the hip abductors are inhibited while the TFL is overactive along with the rectus femoris and other ST sinew channel muscles. In this case, ST channel points are probably the best bet along with local MPs of the necessary muscles.